Stories about innovative workplace design don’t often begin at a warehouse in the sleepy suburbs. But when designers of the Comcast Technology Center wanted employee feedback, they set up shop in a warehouse about an hour away. The workspaces in the 60-story, 1.8 million square foot skyscraper needed to be just right, so designers used the warehouse space to tinker with large open floor plans, spacious sit-stand desks, planning rooms, and quiet areas. The idea was simple: something for everyone. The architects and designers clearly did their research. People hate open offices because they’re too noisy and distracting—and the 4,000 Comcast employees interviewed during the design process made that point loud-and-clear, said Buchholz. But nobody wants isolating, confining cubicles either. Experts say that a healthy mix of spaces combined with acoustic sound-softening solutions promote collaboration as well as heads-down focus work. The Comcast Technology Center designers seem to have achieved the right blend. Each floor has large, open workspaces with vertical sound and vision barriers as well as acoustic material on the ceilings, carpet on the ground, and white noise to deaden sound. There are also 12 to 14 conference rooms on every floor. Some are built for one. Some are built for large meetings. It even features 10 three-story sky gardens with coffee, snacks and convening space. Some sky gardens have more of a collaborative atmosphere with ping pong tables and TVs. Others are more like a library setting with books, dark wood features and quiet. Even employees who were originally hesitant about working in an open office have become fans of the space, said Buchholz. The Comcast Technology Center also has innovative features like chilled beams lining the ceilings. The flat panels drop the room’s temperature as chilled water passes through them. Natural light was also a main concern in the design process. “There are all kinds of studies showing that people work better when they have access to natural light,” said Buchholz. The Comcast Technology Center will house 4,000 technologists like engineers, software architects and designers. They’re gradually moving in each week. 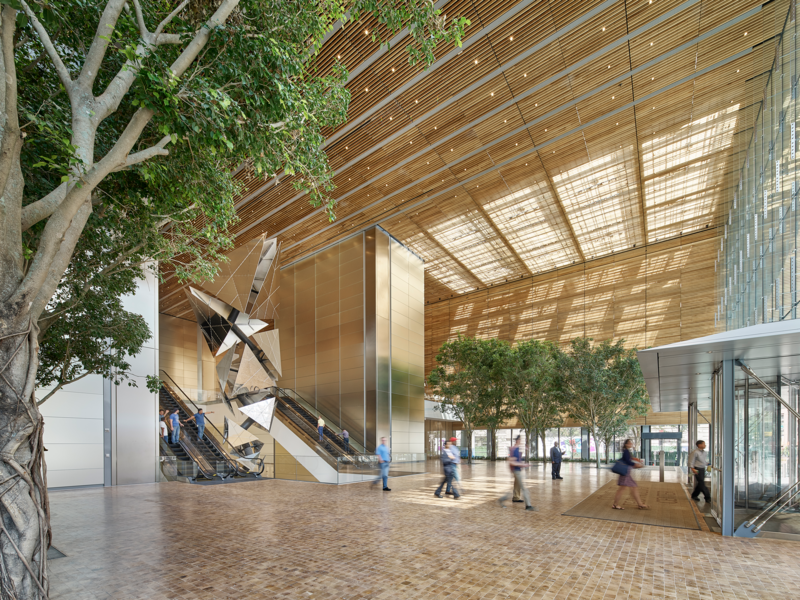 When they get to work, they’re greeted by a lobby with live trees, end-cut wood floors and Conrad Shawcross’ first public art installation in North America. On the ceiling, digital artist Jenny Holzer designed a series of scrolling words that encompass hours of stories, quotations and poetry. Down the street is the Comcast Center, the 58-story, 297-meter (974 ft) tower that is the second-tallest building in Philadelphia. No need to bring a hat, gloves and winter coat to go from building to building—employees can take the underground tunnel connecting them. 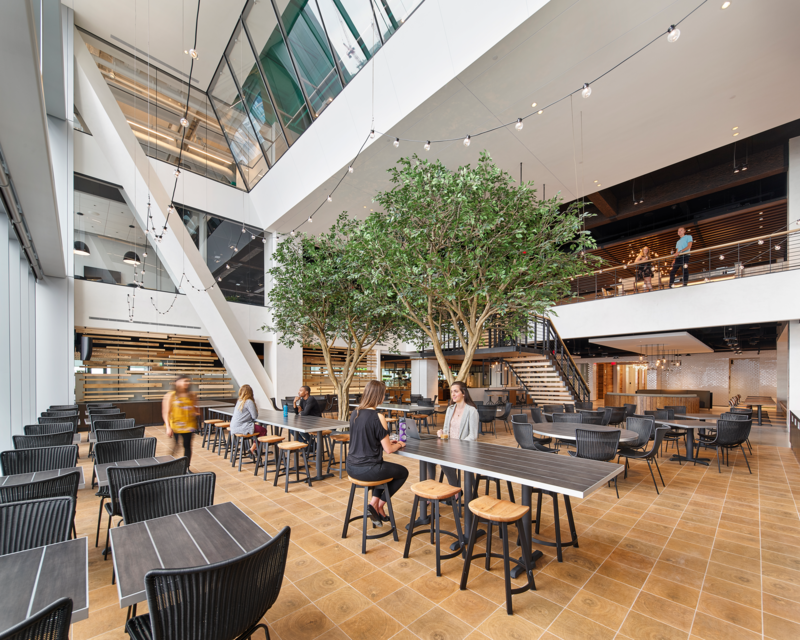 It’s part of a larger effort to create a “vertical campus” where employees feel inclined to congregate with one another at the massive food markets, coffee shops and lounge spaces in each building.